Does Anybody Really Believe that Iran’s “Advisors” in Syria Are Unarmed Non-Combatants? 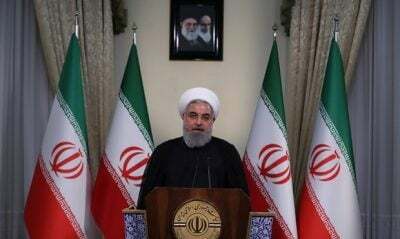 The US, “Israel”, and even Russia have called for the withdrawal of Iranian troops from Syria, albeit for different reasons and expressed in different ways, though Damascus and Tehran have responded by insisting that no such troop deployment ever happened during the seven-year-long war and that the Islamic Republic only has military “advisors” in the country. This is a curious description for foreign fighters embedded with the Syrian Arab Army (SAA) who have even been martyred on many occasions because of their frontline role in “advising” their allies, which would seem to contradict the function of what many assume is just the passive role that these forces are supposed to play in managing military affairs and training their counterparts. It’s unbelievable that Iran would deploy “advisors” on the frontlines of Syria’s anti-terrorist struggle and not properly arm them in the event that they’d have to defend themselves, which would in practice blur the line between “advisor” and soldier by making them more of a combatant than anything else. To be clear, it is the Syrian government’s right to request whatever military assistance it requires from its allies and to describe their services with whatever euphemisms it thinks are appropriate, but at the same time there’s no ignoring that these “advisors” often function as troops that are simply fighting under a different hat. The reason why such word games are being played is because these forces are, legally speaking, only “advisors” in the sense that their formal duties aren’t to directly participate in hostilities even if they’re drawn into doing so for defensive purposes out of “mission creep”, and officially recognizing them as anything else would have immediately drawn an “Israeli” military response. Tel Aviv has since wised up to their real role over the years and has lately, with Russia’s passive facilitation, turned the Arab Republic into one big bombing range of Iranian and Hezbollah targets, but Damascus and Tehran nevertheless feel compelled to keep up the ruse about these forces’ “advisory” role no matter how unconvincing it is in practice to any objective observer. The SAA has grown strategically dependent on the IRGC over the years and fears losing liberated territory if the government is pressured into downscaling their presence as part of a “phased withdrawal”, which is why Damascus is unlikely to agree to this until it feels comfortable enough that its Russian partner has succeeded in convincing Turkey to have its “rebels” honor the existing ceasefire after Iran’s removal from the Arab Republic. The southern front is in the news lately because Damascus knows that Moscow has no sway here and distrusts this region’s “Israeli”, Saudi, and American “rebel” patrons, hence why the SAA is gearing up for an offensive there but also why Russia is leveraging its “balancing” role in order to ensure that this is the final military campaign of the war prior to fast-tracking the political process after what it’s expecting will be Syria’s adherence to the “suggestion” that it ask Iran to leave. Iran, for its part, derives a distinct strategic advantage from the fact that the SAA has grown so dependent on its “advisory” assistance that it’s still utilizing its services to this very day over seven years after the start of the war, without which the country wouldn’t have survived this long even though one would expect that it should by now be able to do things on its own after over half a decade of first-hand experience. Accordingly, Iran envisions post-war Syria functioning as a Damocles’ Sword hanging over the head of its hated Zionist foe, forever keeping them trapped in fear with the thought (whether true or not) that Iran will turn their neighbor into a “rear base” from which to destabilize their political entity in support of the Palestinian liberation movement. The confluence of interests between Syria and Iran explains why they’re cooperating in maintaining the myth that Iran’s military “advisors” don’t have any combat role whatsoever. Nevertheless, it’s precisely because of their game-changing support to Syria and the Arab Republic’s dependence on their services that the US and “Israel” want these “advisors” removed as soon as possible, rightly believing that they’re the lynchpin behind the SAA’s on-the-ground successes (all individual bravery of its own soldiers notwithstanding). At the start of the conflict, this goal was pursued in order to intensify the war but is now being advanced to de-escalate it, which is why Russia’s surprisingly jumped on board with this plan. It should be reminded that a security dilemma has set in between the West (mostly the US & “Israel”) and the Resistance (specifically Syria & Iran in this case) whereby the issue of Tehran’s defensive deployment of “advisors” at Damascus’ request is interpreted by Washington and Tel Aviv as an offensive move designed to turn the country into a launching pad for Iranian attacks against “Israel”. So long as these “advisors” are anywhere “near” (used very loosely in a relative sense) the occupied Golan Heights, “Israel” is going to strike them, thus escalating the country’s Hybrid War of Terror through its “surgical” military interventions and threatening to turn it into an uncontrollable conventional conflict. Russia, whose 2015 anti-terrorist intervention foiled the US-“Israeli” plans to destroy Syria via their proxies, understands this predicament and is therefore working very hard to ensure that neither Iran nor Hezbollah crosses over into southern Syria to assist the SAA in their forthcoming liberation offensive, which is being dangled as a possible “compromise” in exchange for “Israel” withdrawing its support for the militants active near the occupied Golan Heights. The idea is that after this group of “rebels” is defeated and a “gentlemen’s agreement” reached with the US over the future of its al-Tanf outpost, Damascus won’t have any further need for Tehran’s military services since it stands no chance of forcibly liberating either the northern Turkish-backed militant enclaves or the US-occupied one-third of the country in the northeast, consequently “making it easier” for Syria to “save face” by requesting Iran’s “phased withdrawal” afterwards. In the run-up to that prospectively happening, any potential Iranian “advisors” that would have otherwise been deployed near the occupied Golan Heights had Russia not “diplomatically intervened” in brokering an informal deal between Syria and “Israel” would instead be sent on anti-terrorist missions deep inside the host country’s hinterland, therefore preventing any inadvertent aggravation of the destabilizing security dilemma. Should President Assad proceed with the US, “Israel”, and Russia’s separate requests for what would presumably be the “phased withdrawal” of Iranian “advisors” from the country, then the first-mentioned two of them would implicitly accept that he will remain in office because of the impossibility of toppling him after Russia’s 2015 intervention and the removal of any Iranian-linked pretext for “surgically” intervening in support of his armed opponents. None of this can happen without trust, however, and since the Resistance and the West obviously distrust one another, Russia’s “balancing” role becomes pivotal as the only actor capable of bringing both parties together in an informal agreement, however imperfect it may be especially if Iran disagrees with its terms and outcome. President Assad, who’s the object of Russia and Iran’s competing “influence operations” at the moment due to his decisive role in having the final say over whether any of this will go forward or not, doesn’t feel fully comfortable with everything though he’s unable to shape the situation any further to his country’s advantage, which is why Damascus is going along with Iran’s narrative at the moment while simultaneously taking steps to implement the Russian-brokered indirect (key word) deal with “Israel” in spite of its claims to the contrary. The end result of this somewhat clumsy “balancing” act that Syria’s attempting to carry out at the moment is the perpetuation of the unbelievable though “politically correct” (relative to Alt-Media dogma) narrative that Iran’s “advisors” don’t play any combat role in the country, which doesn’t make sense given the many martyrs who have already sacrificed their lives for the anti-terrorist cause there and would presumably have entered into the frontlines of combat unarmed if their “advisory” functions truly didn’t have any overlap with combat ones. The only people who seem to believe this politically contrived euphemistic narrative are the infowarriors disseminating it all over the web because practically everyone else recognizes this for what it is in being a transparent tactic for buying time before Syria can no longer resist the heavy multinational pressure against it in finally calling for the “phased withdrawal” of Iranian forces from the country.